¶ Arizona wants to kill you. I thought the rattlesnakes were bad; now this: "Arizona Hiker Dies After Being Stung by 1,000 Bees." ¶ Americans don't visit national parks anymore — that was the message a couple of years ago. (See the graph for early 2000s.) Now it's "The National Parks Have Never Been More Popular." Free admission for the 100th anniversary helps, so does cheaper fuel. Or is this just one of those "fat is bad for you / fat is good for you" deals? Will M. and make it to Yellowstone this fall? 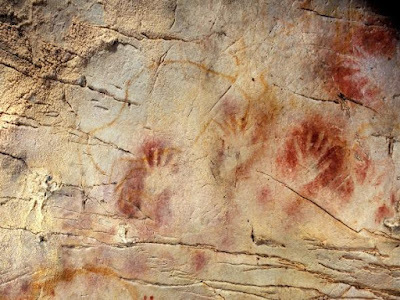 ¶ In case you missed it — although we are not talking about Chauvet-type art, still the evidence is that the Neanderthal people made art. And of course it's older than the Cro-Magnon stuff. Trinidad, Colorado, streetview (Pueblo Chieftain). The red brick streets, historical buildings and gorgeous mountains to the west are just a few characteristics that make this small town a place that catches the eye. Because of that, Gov. 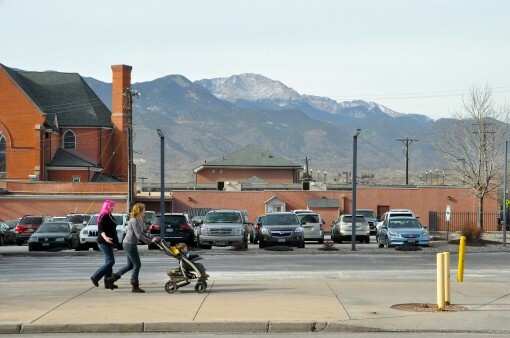 John Hickenlooper has chosen Trinidad to be the first town to participate in the first state-driven initiative in the nation for affordable housing and workspace for artists and arts organizations. 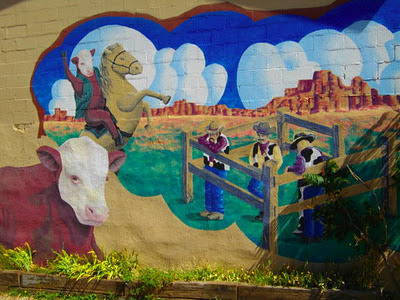 The Space to Create Colorado program also will position Colorado as the nation’s leader in artist-led community transformation in rural creative place-making. “The feeling is amazing. The change and excitement is palpable. It’s all over,” said Marilyn Leuszier, chair of the newly formed Corazon de Trinidad Creative District. This is the "X is magic" school of economic development, where X is semiconductors, Christian ministries, rockets, artists, outdoor recreation, information technology, marijuana . . . Yes, Trinidad has lots of Victorian commercial architectures (cheap rents) and brick streets, but to some southern Coloradans that it also has a certain reputation, as in, it helps to have a few cousins to cover your back. A former co-worker, once a varsity basketball player at Cañon City High School, claimed that when they played in Trinidad, the players left without showering — just got onto the bus in their sweaty uniforms and hit the road, rather than stay longer and invite some kind of trouble. Sadly, this reminds me a little of Las Vegas, New Mexico, which for the last few decades has been heralded as "the next Santa Fe," but which still is not. Given that Pueblo, ninety miles north, now has a genuine "creative district" — if putting up street signs makes it so — maybe Trinidad will be the next Pueblo? I cannot embed the video due to privacy restrictions, but follow this link to a brief trailer to a short documentary about artist/cave digger Ra Paulette. Ra Paulette creates cathedral-like "eighth wonder of the world" sculptural caves using nothing but hand tools. Working in the malleable sandstone cliffs of Northern New Mexico, his creations rival the work of the great earth artists — Goldsworthy, Heiser, Smithson. But Ra’s work has gone unrecognized. 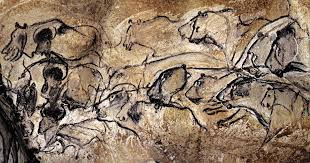 Patrons who commission caves often cut him off due to artistic differences or lack of funds, leaving Ra struggling. Following his passion has cost him almost everything. Undaunted, at age 65, he’s decided to pursue his 10-year magnum opus on public land, without permission [really?! ], working for no one but himself. Visit the artist's website for a slideshow and more information. This item is from January, but it appears that entries are still accepted. An homage to the Japanese artist Hokusai, of course. Yes, in homage to the late Ed Quillen, I keep the apostrophe in the name Pike's Peak. • Off-topic but fascinating. Sewer-diving in Mexico City (with video). Sewer-cleaning the "fatbergs" in London (with video). More sewer history. The good old days of scavenging in sewers. • The Humane Society of the United States is sued for racketeering and other issues. District judge Emmet G. Sullivan did dismiss allegations of mail and wire fraud, but he did so only because Feld didn't have standing to file this charge. His ruling all but set the stage for a class-action RICO lawsuit against HSUS for misrepresenting itself in its fundraising campaigns across the nation. This lawsuit easily could bankrupt HSUS, put it out of business and send some of its top executives to prison. Funny, isn't it, that you have to go to a blogger to hear about this. 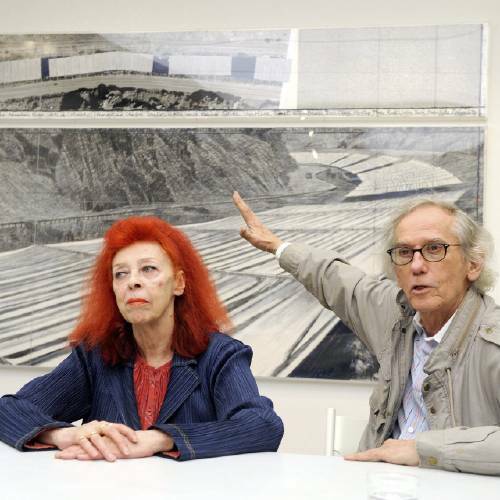 • Ze artiste Christo has pushed back the construction of "Over the River" yet again. Tourism-industry types are dismayed, try to find silver lining. I understand the argument that asks how pristine is a canyon with a highway(US 50) and a railroad in it already. But I do think that the Bureau of Land Management should have restricted OTR to the stretch between Texas Creek and Parkdale, because if there are highway blockages — and there will be — one could detour around on Colorado highways 96 and 69. 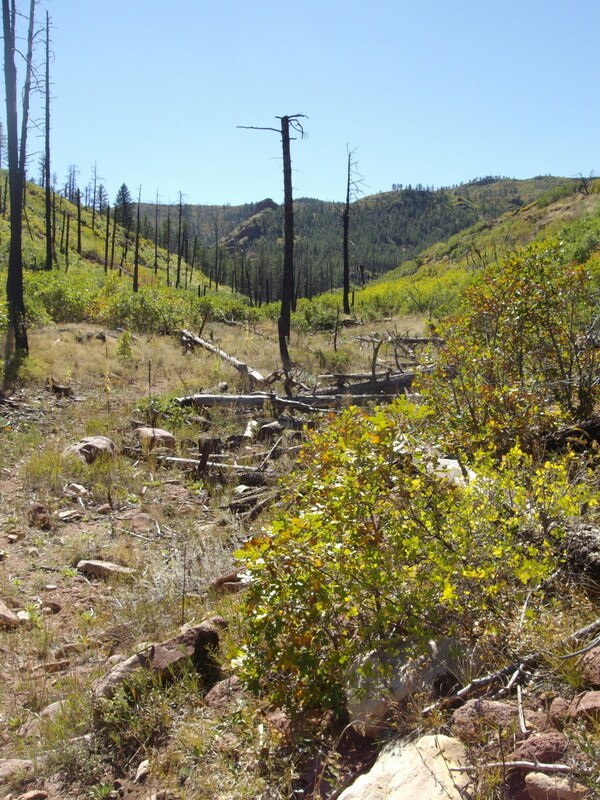 Upstream of Texas Creek, there are no detours, except very long, twisty, gravel roads through the mountains such as Fremont County Road 2 or an even longer highway detour up to Hartsel and Antero Junction. It doesn't take much to close US 50 now: a little roadside fire, a car going into the river, a truck hitting a bridge abutment — I have seen all of these. • Oh yes, and this: tracking coyotes with GPS collars in urban Chicago. As a Forest Service district ranger in the Black Hills, Dad was present for the creation of Korczak Ziolkowski's huge Crazy Horse monument. I remember seeing it as a little boy, when it was just a ridge with a notch in it created by dynamite and earth-moving. I was familiar with Mount Rushmore, and I could not see how this ridge and notch would ever be anything like that. From Crazy Horse Memorial website. Dad always dismissed Ziokowski himself as a nut. Fast forward twenty years: I go back as an adult and yes, I can see where the warrior's head, his outstretched arm, and the horse's head are supposed to be. When I visited two years ago, there was a face. The New York Times visits the Ziokowski family's ongoing project, now in its sixty-fifth year, to build the world's largest sculpture. It's a little like one family deciding to build a Gothic cathedral. Progress is slow. The Indians' own response has been mixed over the years. “I’ve never heard a single Native American, not one, ever say I’m proud of that mountain,” said Tim Giago, the founder of Native Sun News, based in nearby Rapid City. Thomas Shortbull, president of Oglala Lakota College, which receives a number of scholarships from the foundation, acknowledged the discontent. “But most people see the positive of filling the void of the lack of recognition that we have in this country for Indian people,” he added. Although the idea originated with Indian leaders — “this is to be entirely an Indian project under my direction,” Henry Standing Bear, a Lakota chief, wrote in a 1939 letter to the sculptor — Mr. Ziolkowski discovered after his arrival that the local tribes had little to give, either in money or labor, Ms. Ziolkowski said. Dad last visited the Black Hills in 1999, a few years before his death. We did not visit Crazy Horse—his agenda of people and places to see was more personal to him. I go by it now when I am in the Hills and realize that as a boy I underestimated the Ziolkowskis' tenacity. Maybe one day the Crazy Horse Memorial will be seen as an important American site. The motto of "Never Forget Your Dreams" has wide appeal, and meanwhile, Crazy Horse has a webcam. Christo plans to stretch fabric over the Arkansas River for two weeks in August 2014, an effort that critics who've dubbed themselves "ROAR," or Rags Over The Arkansas River, maintain is as risky as mineral development. The installation would cover some 5.9 miles of the river and require the drilling of more than 9,000 bore holes, some 35 feet deep, in a critically sensitive wildlife area, according to a suit filed by the Environmental Law Clinic at the University of Denver Sturm College of Law(PDF). The suit against the Bureau of Land Management maintains Christo's project "requires the use of equipment commonly used in mining and road building, such as hydraulic drill masts mounted on Cat 320-330 long-reach excavators, Cat M313D—M322D wheeled excavators, boom truck cranes, grouters, air compressors, water tanks, grout mixers, support trailers, steel rock anchors, and anchor frames." So ROAR has roared. Their website links to more news stories. The BLM, which approved the project, says that it was "thoroughly analyzed." Why Not Occupy "Over The River"? Although there is still a lawsuit pending, and some regulatory hurdles to be jumped, it appears that zee artiste Christo is well on the way to disrupting life for many people in Fremont, Chaffee, and Custer counties for two and a half years. Nothing but fawning in the local news media. This Franco-Bulgarian multi-millionaire has gotten the feds, the state government, and local governments to give him use of public lands with which to make more money. It's a bail-out for "art." Is there any better definition of being part of the "1%," as the Occupy protesters say? Of course, "Over The River" will benefit us poor peasants by raising our artistic consciousness. Or something. Motel owners stumble around mumbling "400,000 visitors, 400,000 visitors." Yay for them.
. . . in La Veta, Colorado. • And George Herter would have had some pungent things to say about death by GPS! (Hat tip: Odious & Peculiar). • Two Colorado state parks win environmental education awards, one for an art class in the spirit of Andy Goldsworthy (whose work, believe me, is not as simple as it looks). Since 2009, the Art in Nature Program has been a terrific vehicle to engage youth from the juvenile justice system's probation department. The young people start out yawning, uninterested and fidgety, but once they get outdoors, that attitude changes. As they gather the natural materials, including leaves, rocks and branches from the ground, to create a piece of art, they become engaged both physically and emotionally. They become children again, laughing and playing in nature. A sense of pride and community develops within the young people as they build their sculptures and work together. DENVER, Colo. - The Colorado Division of Wildlife is soliciting original artwork entries for the 2011 Colorado Waterfowl Stamp Art Contest. This year's species of focus is the green-winged teal (Anas crecca). The deadline for artists to submit entries is 4 p.m., Friday, March 4. "It is amazing every year to see what the artists come up with and to see the new artists that are starting out in this specialized category of art," said judging committee member Tilman Bishop, a former state senator who sponsored the legislation that created the waterfowl stamp in Colorado. "We are all beneficiaries of the Waterfowl Stamp," Bishop added. "Whether you are a hunter, a bird watcher or just a citizen that likes seeing birds around the house, every one of us gets the benefit of this terrific program." The green-winged teal is a colorful duck found in Colorado primarily during fall and spring migration, with lower numbers during the breeding season and winter. The vocal and often noisy duck is the smallest North American 'dabbling duck', which feed on the surface of waters instead of diving for food. It is one of the most frequently harvested ducks taken by Colorado waterfowl hunters, and is known as excellent table fare. Artists must submit a 13-inch high by-18 inch wide, full color original artwork for the contest. There is a $50 fee for each entry. Complete requirements are explained in the application packet. Mary Scriver delightfully dissects the house organs of the Industrial Cowboy Art Cartel. Read the whole thing. She has been doing some more critical work in the field as well: a biography/memoir of Western artist Bob Scriver, to whom she was married, and comments on the issue of artistic legacy as well.